The TMNT, Ninjara and Master Splinter set sail for home when they’re met by a terrific storm that capsizes their tiny craft and washes them ashore a nearby island. When our heroes awake, they’re welcomed by local natives who think the mutants are emissaries of the ocean god. Then, much to the Turtles’ surprise, Christopher Columbus and his soldiers arrive. The invaders surround our heroes while Columbus congratulates himself for discovering a new route from the west to the east. 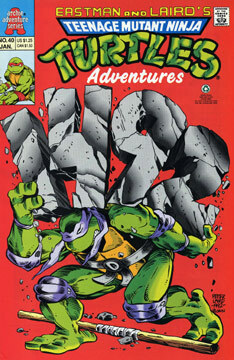 The captain orders one of the Turtles to be separated from the rest and taken to his ship – Donatello is chosen. Later that night, Don is awakened by Columbus, who explains that he’s seeking enough gold to recover Jerusalem, his personal crusade. Meanwhile, on the beach, Columbus’ soldiers begin to assault the local women, and the Turtles leap into action. The mutants make short work of the soldiers and head out to rescue Donatello. On the ship, Donatello meets a strange creature, an Earth spirit called the Other. The Other explains that the TMNT had arrived on this spot exactly 500 years after Columbus had done the same. The locale is one of Earth’s “power spots,” where the sacred energy of the planet collects. So the Turtles’ arrival on the Power Spot on such a historic anniversary has triggered a temporal overlapping, causing the mutants to travel back in time to witness Columbus’ arrival. The Other also explains how the “discovery” of the “new world” lead to fiasco for the native inhabitants of the land, from killer disease to enslavement. The Earth spirit then hands Don his bo staff and disappears, just as Mikey arrives. The borthers hug and then make their escape – a huge storm has arrived once again, and everyone jumps into the sea. The next morning, Donatello awakes to find a cruise ship anchored offshore. Our heroes get on board the craft, which carries them back to New York City.